Offering lifelong and developmental learning to over 13 million students at nearly 1,200 schools, community colleges in the United States attract a student body with remarkable economic, ethnic, and cultural diversity. They provide students with skills and foundational knowledge upon which successful professional careers and rewarding personal engagement can be built. This identity makes community colleges uniquely suited to teach global awareness and community building. Yet the development of peacebuilding and conflict resolution curricula is still a relatively new effort at these institutions. In Peacebuilding in Community Colleges, David Smith underscores the importance of community colleges in strengthening global education and teaching conflict resolution skills. 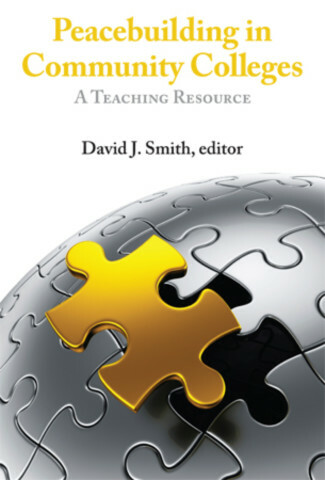 Enlisting contributions by twenty-three community college professionals, Smith has created a first-of-its-kind volume for faculty and administrators seeking to develop innovative and engaging peacebuilding and conflict resolution programs. Through case studies, how-to’s, sample syllabi and course materials, and inspiring anecdotes, contributors draw on learner-centered strategies, experiential learning, and interdisciplinary relationships to teach practical skills and strengthen global connections. The contributors are sensitive to the complexity of teaching a community college student body that often closely reflects the diversity of the local population. They discuss the challenges and opportunities presented by different learning communities—including, for example, significant military, diaspora, and religious populations among their student bodies. Providing a common frame of analysis, Smith discusses important trends and future challenges for community colleges teaching peacebuilding, such as the transferability of credits to four-year institutions and the need to establish skills-based programs that can lead to defined and better employment opportunities. This volume is certain to be an invaluable resource in the field of peacebuilding education. Peacebuilding in Community Colleges is at once practical and visionary, urging the community college beyond its local mission toward global impact by displaying approaches for making a direct and literal difference in the world. Unquestionably, a useful text for campus internationalization.